Loved your post. I’m trying to make a perfume with vetiver and ylang ylang that i have at home. Would like to know what i should add to it..one more oil maybe? Nothing too expensive or Photosensitive Do you have any suggestions? Thanks. Hi there! Well, you’ve got your base and middle notes pretty well covered with Vetiver and Ylang-Ylang. Why not try for a top note? Grapefruit would be my first thought, but it’s photosensitizing. Bergamot goes well with everything and can be purchased in a safe “Bergaptene free” version, and sweet orange would be pleasant as well and is supposed to be safe. All should be relatively inexpensive. Here’s a link to Bergaptene free Bergamot. Ylang-ylang is also SO nice rounded out with Rose, if you have any. That would make a lovely heart note. Rose is expensive though. An alternate idea might be to try rounding things out with a little rose geranium, which would be much more affordable. This is a nice article on good combos in organic perfumery that you might enjoy. 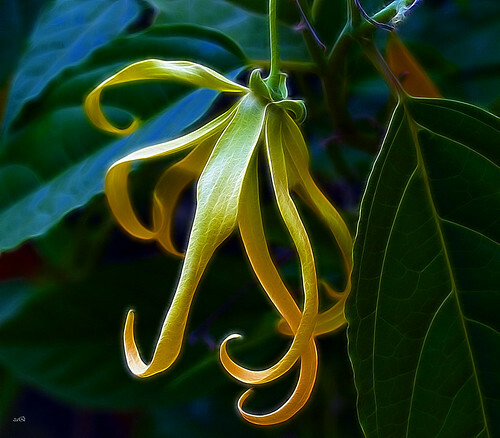 Both Vetiver and Ylang Ylang are listed – so there are applicable ideas here!